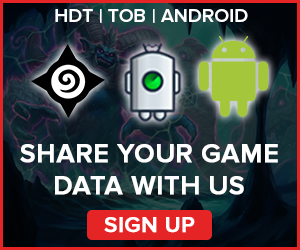 A weekly Hearthstone Meta Report based on data from over 100,000 games. 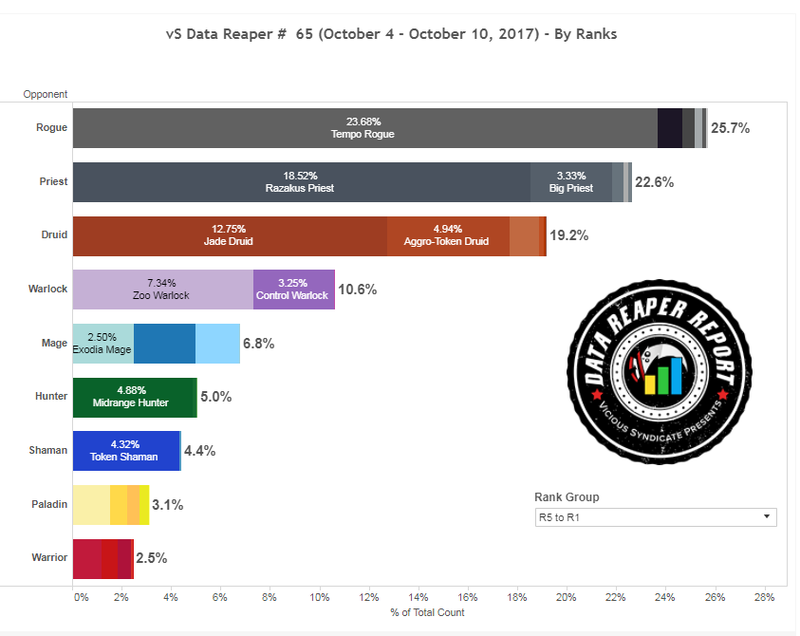 Welcome to the 65th edition of the Data Reaper Report! 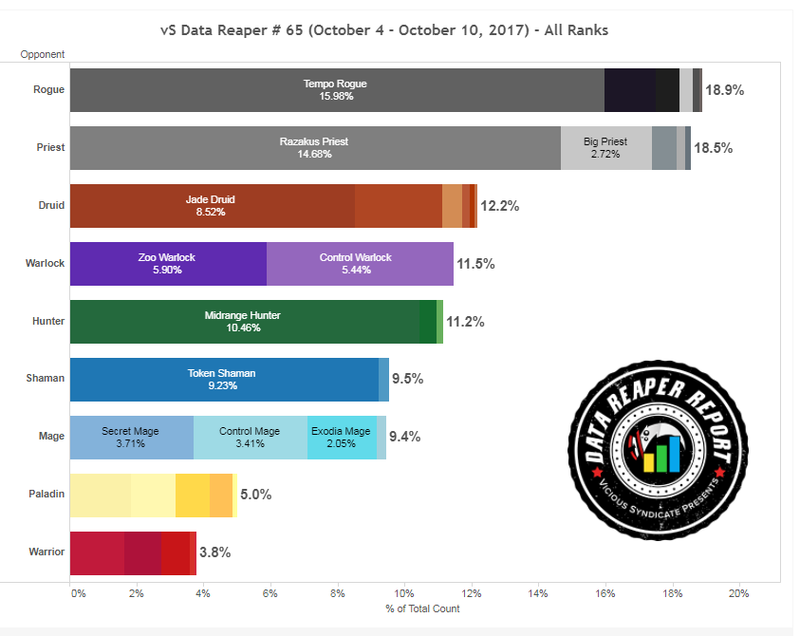 Our Data Reaper Project, including the Data Reaper Live (Beta) has 4,500 active contributors. Without them, this project would not be possible, so we’d like to thank all of our contributors for their help. Note: Due to the timing of the report at this stage of the month, recent legend data is fairly scarce. In addition, the bottleneck to legend at ranks 1-5 is a better representative of the current meta and the power level of decks (and it’s more competitive than the legend meta). Therefore, we will be mostly focusing on ranks 1-5 in both the frequency discussion as well as the power ranking discussion. The Rogue population continues to increase at higher levels of play, exceeding 25% at the bottleneck to legend. Tempo Rogue is a very dominant archetype making up most of the class’ numbers while other Rogue decks have fizzled out. Do note that within Tempo Rogue, there is quite a diverse set of builds and approaches, and the archetype continues to see a lot of experimentation. Priest is the second class that exceeds 20% representation at the bottleneck to legend. We can observe a significant convergence of Razakus Priest builds, with the archetype nearing completion of its refinement stage. Big Priest maintains a modest representation in comparison. Druid is in the midst of a significant surge in its popularity. It is nearing the popularity of Rogue and Priest, and will likely match them by next week. Jade Druid is at the core of this uptick in play, and is continuing to see a shift in its build approach, moving away from defensive Doomsayer lists and favoring Mark of the Lotus centered builds. Aggro-Token Druid has also become more popular, and we can observe an uptick in Big Druids, though the archetype’s prevalence is still very low. Together, these three classes make up nearly 70% of ladder opponents at ranks 1-5, and this number keeps growing every day (At rank 1, these classes make up over 75% of ladder opponents), while other classes are continuing to give up ground. In terms of class diversity, the post-patch KFT meta looks a bit one-dimensional, though not nearly as bad as before the balance changes. Mage, Shaman, Paladin and Warrior are either seeing stagnation or small declines in play, and the latter is particularly true at higher skill levels, where the Big 3 are dominating in their representation. There are two exceptions to this trend: Hunter’s fall continues to be very steep, and it’s quickly sinking to the bottom of the pile. Warlock has persevered and maintained stable representation, thanks to Zoo Warlock’s solid standing in the meta, though the same cannot be said for Control Warlock builds. Note that based on our current sample of legend games, the power levels of decks are very similar to that of the ranks 1-5 table at this stage of the month, so we’re comfortable drawing conclusions that also reflect the highest levels of play. If there are potential differences, we will mention them. Though class diversity is certainly not nearing the standards set by the Un’Goro meta, there are encouraging signs when it comes to the power levels of decks. Tempo Rogue is clearly very strong and is the most successful deck in the current ladder meta, but the margin of difference is not huge and we can see that its score has dropped below the 53% mark. It has an extremely consistent matchup spread and very few weaknesses, but it’s not out of control. The Big 3 appear to be balancing each other out, and while these classes are clearly more popular than the player base would like them to be, no deck is unbeatable. Jade Druid continues to rise in its win rate very steadily as its internal improvement continues, while Razakus Priest has taken a big hit in its performance against the field. 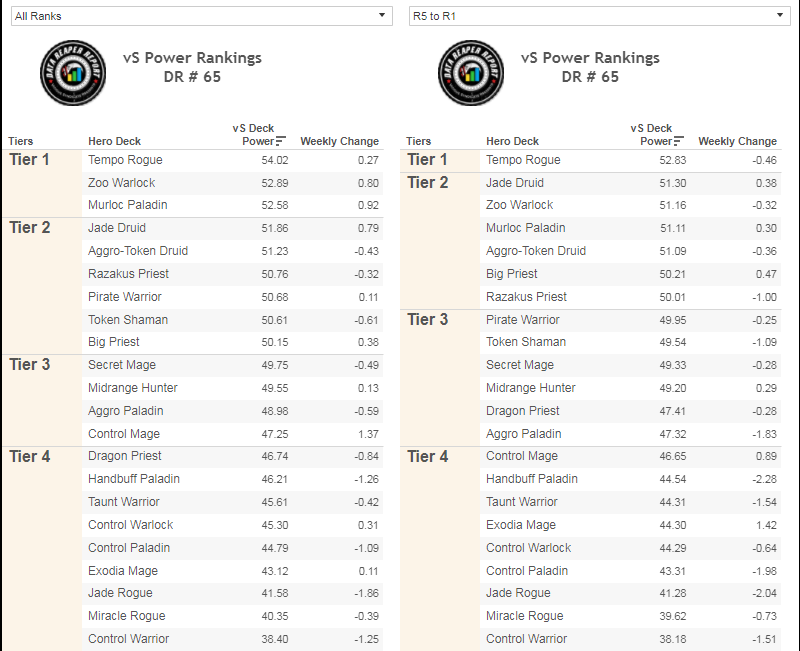 These two trends correlate with each other since Jade Druid is a reliable counter to Razakus Priest, and its continuing rise in popularity, as well as its internal shift towards builds that perform better against Priest, will likely spell the end of Anduin’s aspirations for ladder dominance. Razakus Priest will remain a strong ladder deck, largely considered to be Tier 1 in the pro community due its strengths in a tournament setting: its primary counters are decks that don’t see much play in tournament formats (Exodia Mage, Big Priest), and Jade Druid can be banned out. Ironically, had Jade Druid been nerfed harder without any tweaks done to Razakus Priest as well, Priest would have likely spun out of control. One of Razakus Priest’s counters, Big Priest, has now eclipsed it in its win rate. 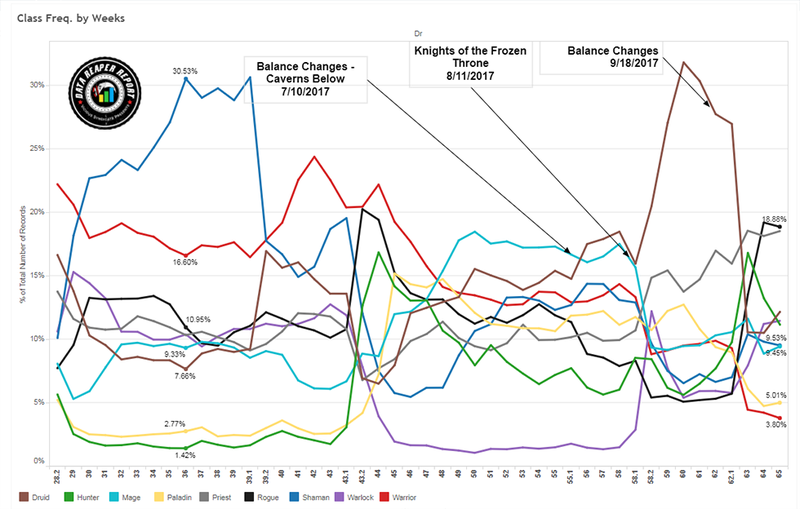 As we’ve said last week, the meta trends are favoring Big Priest’s playstyle due to the continuing decline in aggressive decks. This gives Big Priest more time to carve out its game plan, and it’s less reliant on drawing Barnes early in order to win. Zoo Warlock, Murloc Paladin and Aggro-Token Druid maintain respectable win rates against the field. Warlock and Paladin drop in their win rates at higher levels of play due to the presence of Tempo Rogue, but these are definitely strong decks to climb with, even if they hit a wall eventually (especially when it comes to Zoo, a deck we’ve seen carrying a limited ceiling). 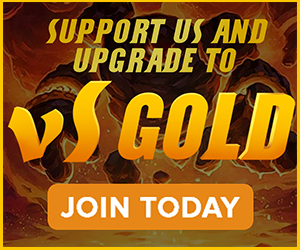 While Zoo’s win rate is supported by its significant ladder presence, Murloc Paladin is still suffering in its ladder representation due to the after effects of the balance changes. The meta continues to become more hostile to Token Shaman, and we’ve noticed that it’s losing ground in the matchup against Tempo Rogue. Combined with its difficult matchup with Priest, Token Shaman finds itself falling below the 50% win rate. With the decline in Shamans, Midrange Hunter has finally stopped the bleeding and its win rate has stabilized at a mediocre, but not unplayable, spot. Pirate Warrior has fallen below the 50% mark. This is the result of the archetype reaching stagnation. It’s simply out of ideas, and while other decks have improved over time since the balance changes, and become more efficient, Pirate Warrior was figured out on day 1, and started to lag behind until it was completely outclassed by the versatility of Tempo Rogue. Patches found a new friend. One archetype we’d like to mention, that isn’t present in the table, is Silence Priest. From our small sample, it has significantly jumped in its win rate over the past week and it’s currently hovering around the 50% mark. The deck performs well against Jade Druid and Razakus Priest, but it hasn’t received much attention. We think it’s worth exploring! Tempo Rogue remains the most popular and strongest deck in the game. It continues to go through experimentation as the search for the best list continues. The latest hot trend in Tempo Rogue builds is running Cairne Bloodhoof. Cairne offers a strong turn 6 play in a mana slot that is usually vacant in the Rogue’s curve. As a sticky body, it synergizes well with a Bonemare follow-up since it’s so difficult to remove. Its stat distribution makes it very resilient to Priest’s removal, and it’s also very annoying for Druid to deal with. Cairne also increases the strength of Barnes, in lists that utilize the 4-mana legendary. The card that often gets cut when Cairne is included is one Cold Blood. Cold Blood is a very strong card, but you usually don’t want to draw both copies, since it often acts as a finisher or a way to leverage an established board advantage into pressure. The two most popular Tempo Rogue variants remain the Scalebane builds and the Hydra builds. Both 5-mana cards are important in order to pressure Priests and Jade Druids into uncomfortable spots. The biggest hole in Tempo Rogue’s curve is the 4 mana slot, and the options available will usually be the weakest cards in the deck. Nevertheless, Barnes makes a lot of sense in lists that run Scalebanes on top of Cairne, as it can generate a pretty significant tempo swing. For Hydra lists, Prince Valanar has become a popular choice, with Orange and Pavel bringing Hydra/Valanar builds to the HCT Summer Championship. Valanar’s synergy with Hydra works in two ways: It’s a taunt, so it protects the Hydra from trades much like Tar Creeper does, and it can also help recover the health lost from Hydra’s drawback. Another option in the 4 slot is Xaril, but unlike the other two 4-drops, it’s a purely negative tempo play, so we’re not big on the card. While these two variants are the most established and popular ones within the Tempo Rogue archetype, there are more running around, some of them being quite different. The most successful example is Hypno’s unique Corpsetaker build. This list builds around the 4-drop to the extreme with Stormwatchers and Argent Commanders present. With Cold Bloods and Bonemares also included, leaving up a Windfury-powered Corpsetaker is quite dangerous. This may look like a very janky deck, but Hypno was the second player to hit legend on EU this month with the list, and he has just recently hit #1 with it as well! While Tempo Rogue is very dominant, and seems to do no wrong when it comes to card choices, other Rogue archetypes are not seeing the light of day. Miracle Rogue has declined to the point where it’s almost non-existent, while Jade Rogue and Mill Rogue could be fun, but they’re not competitive. Razakus Priest seems to be entering its final phase of development. At this stage, it has become clear that the Circle build is the superior choice and the new standard going forward. Circle of Healing just has so many uses: It’s a board clear with Auchenai, it’s an amazing draw engine with Cleric and it’s free damage with Velen in the late game. Most top level builds agree on 28 cards, with the final two forming an interesting debate. The first debate is Doomsayer vs. Golakka Crawler. Since most aggressive decks are declining, especially at higher levels of play, Doomsayer’s stock has been dropping. Golakka Crawler is better in the Tempo Rogue matchup quite often, and is a minion you can play on the board in slower matchups rather than being dead in your hand. Why not play both? It’s hard to find room for two cards that are weak in the mirror and the Jade Druid matchup. Doomsayer is a superior choice at lower levels of play where Shamans, Hunters and Paladin are much more common. We’ll leave Doomsayer up in the standard list and suggest Golakka as an alternative if you’re mostly facing the Big 3. The second and most interesting development is the inclusion of Gadgetzan Auctioneer over Lyra the Sunshard. A few players are bringing an Auctioneer list to the HCT championship, and multiple players hit #1 legend with an Auctioneer build this week. Since the archetype has fully embraced its combo-centric win condition, with an OTK through Mind Blast, adding even more cycle to synergize with your cheap spells makes a lot of sense. Auctioneer is slower than Lyra, but allows you to have late game power cycle turns that brings you closer to Raza, Anduin or both, and we all know drawing these cards means winning the game. Auctioneer definitely has a strong case, but it’s not clear at this point whether it’s better than Lyra. While Lyra doesn’t cycle your deck, it is still very strong as a support card and an alternative win condition. It can win games by itself if your combo has not been drawn, especially against faster decks when you’re trying to stabilize and end the game. It is also a card generator, providing further ammunition to your “machine gun” if Velen is not drawn, making your Radiant Elemental a much stronger enabler. Finally, it can checkmate Jade Druids, since they often have difficulties removing it if they don’t have a board themselves. So, rather than adding cycle, Lyra gives you a fallback cushion for draw inconsistency and can swing games in ways Auctioneer cannot. Other Priest decks are also seeing developments. Big Priest, as we’ve said last week, is a strong choice since it is well positioned in a meta dominated by the Big 3. The likely best approach for the deck minimizes the amount of singleton spells in order to increase the consistency of Shadow Visions. A consistent Shadow Vision is important since against Razakus Priest and Jade Druid, you want to generate more Eternal Servitudes, and you are more likely to do that if the pool of spells in the deck is reduced. SirVilgaudas hit #76 legend with a Dragon Priest build that runs the full Divine Spirit/Inner Fire package, looking to prey on other Priests since they struggle to deal with powerful mid-game minions as well as big threats. In a similar vein, a Silence Priest deck that runs the DS/IR combo could also be strong in the meta while also performing better against Jade Druid due to being faster. Overall, Priest is one of the most powerful classes in the game and has likely never been stronger in any period in Hearthstone’s history. Revel in it, Priest fans, since we all know how dramatically the pendulum can swing. Druid finds itself as the third most played class at higher levels of play this week. Jade Druid’s power level has been growing every day, and while Aggro-Token Druid has fallen in its play rate since the balance changes, it is still very strong and is making a small comeback. Snoobyboo has hit #1 legend with Casie’s Jade Druid. Mark of the Lotus builds are largely responsible for Jade Druid’s rise in win rate. Medivh is a very strong card in the mirror as well as against Priest, and ramping to him early can also help swing games against faster decks. Needless to say, it’s very hard to deal with an Atiesh-powered UI. Mark of the Lotus gets a lot of value in Jade Druid. In combination with Spreading Plague, it is a game-ending play against aggressive decks, and it can apply a lot of board pressure against slower decks since Jade Druid usually has multiple minions on the board. Having just three minions buffed by Lotus is already a very powerful tempo swing for one mana. Being a cheap card with high potential value makes it work really well with Ultimate Infestation, much like Jade Idol, since you’re incentivized to dump your hand as efficiently as possible. The single copy of Power of the Wild acts as a third Mark of the Lotus, and occupies the flex spot for this build. It can be replaced by pretty much anything depending on the meta. Senfglas hit #1 legend with a slightly different list, while Tyler took it to #1 as well. This build omits Medivh and Power of the Wild for two Mind Control Techs. The thinking behind MCT is that it’s a decent card against aggressive decks while also being strong in the mirror. The mirror often forces players to flood the board to win the Jade race, opening up a possible swing of MCT stealing a large threat. Aggro-Token Druid remains very diverse in its build approach, and players are having success with many lists. Dshmitt’s list is the fastest and strongest in aggressive mirrors where you want early game consistency. NeutralMilk’s Hydra list provides more power against Jade Druid and Razakus Priest while maintaining a standard shell. Derpy’s Pilfered list looks to improve these matchups further and is the best approach against slower decks, but it does sacrifice early game consistency. Finally, Big Druid has raised its head and is taking advantage of pocket meta’s at the highest levels where Priest and Jade Druid are extremely prevalent. Multiple players hit legend early this month with Pinilikute’s Big Druid, which maximizes ramp and late game greed to dominate the matchups the archetype excels at. The decline in aggressive decks may help Big Druid find a bigger niche in the current meta. Warlock continues to sit just outside of the Big 3 in terms of representation. We’re seeing Zoo continue to develop and change in its build, while Control Warlock is declining in its play rate due to being poorly positioned in the meta. New Zoo Warlock builds are transitioning towards a bigger demon package as well as running Bloodfury Potion, which allows an early demon to get out of control quickly and either dominate the board or pressure the opponent’s life total. As such, demon synergies are well represented with Blood Imp and Crystalweaver seeing significantly more play while Fire Fly has started to lose favor. Blood Imp, in particular, becomes a stronger card in a list that runs Bloodfury Potion. Satellite hit #1 legend while Zananananan hit #6 legend with lists that embrace this approach. Zananananan’s list includes a pirate package with Southsea Captains while Satellite omits the pirates for Vicious Fledglings, and opts for a beefier mid-game that includes Cobalt Scalebanes. 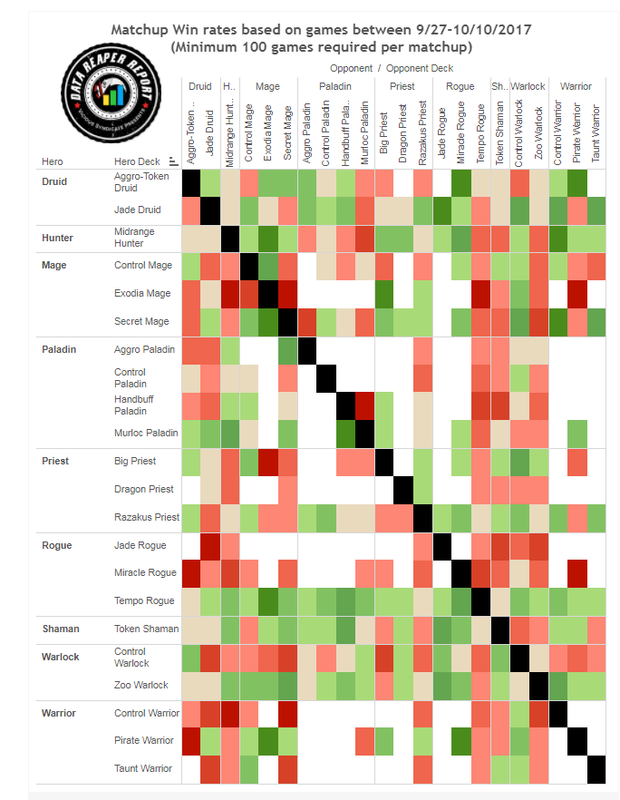 Mage has settled into a middle-of-the-road spot in terms of representation, with three archetypes that see a modest amount of play. Secret and Control Mage are more popular overall, but at higher levels of play, Exodia Mage overtakes them. This is likely due to the increasing amount of Jade Druids and Priests, with players looking to gain an edge specifically against them. Secret Mage does well against the slower decks of the meta, but is hurt by the influx of Tempo Rogue. The deck’s main weakness lies in its inability to deal with wide boards outside of a Primordial Glyph pull. Secret Mage excels when it has the initiative and protects its board with Counterspell, but struggles to come back to the game once it falls behind and is forced to play catch-up. Control Mage hasn’t seen much change this week, and struggles to balance around having enough tools to deal with aggressive decks while maintaining some form of resistance against Priests and Jade Druids. Compared to the other Mage decks in the meta, Exodia Mage is the weakest against the field. Its biggest assets are decent matchups against Razakus Priest and Jade Druid, so it does retain a niche on ladder with players hoping to snipe these matchups, but you generally don’t want to run into most other decks on ladder. Hunter continues to decline this week, especially as Tempo Rogue decks continue to improve and take over the top ranks. Although Hunter is still alright against two of the Big 3 (Razakus Priest and Jade Druid), these matchups are close to even, which doesn’t give Hunter much of a chance to become a reliable counter class. On the other hand, matchups against Tempo Rogue, Token Shaman and the growing presence of Zoo are bad enough to continue sinking the class. Midrange Hunter’s poor matchup spread has also translated into mostly being absent in the the tournament scene. Only one player, OmegaZero, brought Hunter to the HCT Championship. His list is very similar to Feno’s build with small modifications. One Unleash the Hounds and one Hyena are cut for Tracking and Dire Wolf Alpha, while Deathstalker Rexxar replaces one Highmane. Shaman continues to be a decent choice on the ladder, but it is sorely outshined by more popular and more powerful archetypes such as Tempo Rogue, Jade Druid and Razakus Priest. Token Shaman does well enough against Rogue and Druid, but has a difficulty tackling Priest, which drops its usage rate at higher levels of play. Usage is not the only issue that is plaguing Shaman, but diversity as well. If you want to play Shaman with a respectable chance of winning, the only choice you have is Token Shaman. The deck has remained virtually unchanged since very early after the launch of KFT, and is extremely similar to the deck it was during the Un’Goro meta. 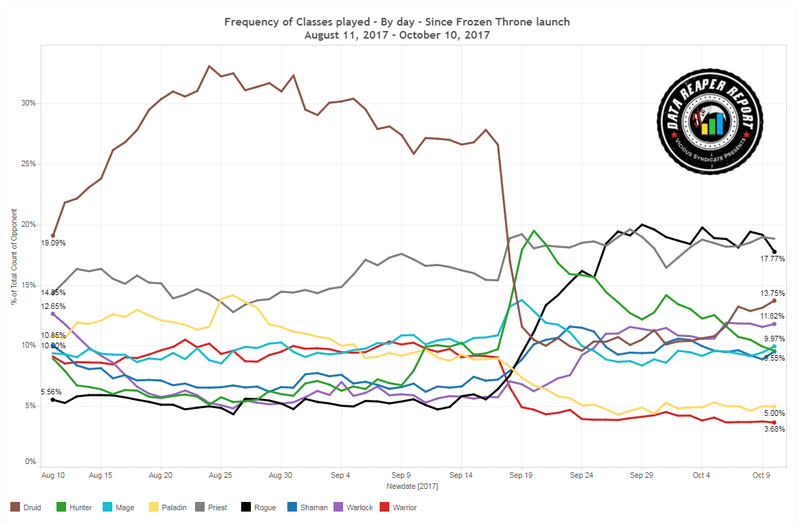 The class is dying for something new and interesting that actually works, after most of its design space in KFT was dedicated to a new idea that’s still in its diapers and might never pan out: Freeze Shaman. Murloc Paladin still has a very strong win rate, but the class continues to linger towards the bottom in terms of representation. Murloc Paladin does fairly well against Priests and Jade Druid but has a very difficult time against Tempo Rogue. This weakness is likely the root cause of Murloc Paladin’s underrepresentation. Other Paladin archetypes are fairly stagnant in terms of development, and we don’t have much to say about them this week. The big story this week is Alpha’s #19 legend Murloc Paladin list that cuts Tidecallers and features Menagerie Magician, which has Stegodon (from Spikeridged Steed), Gentle Megasaur and Cobalt Scalebane as non-Murloc targets. This deck is highly teched to beat Jade Druid, as the various buffs as well as the Magician can create really oppressive board states that the Druid’s toolkit cannot handle. Since the deck carries so much mid-game power, it also does decently against Priests (the Curator/Scalebane builds are the best choice if you want to beat Priests). The weaker early game and heavier reliance on minions to stick, however, makes your Tempo Rogue matchup even worse, so be mindful of that before taking the list to ladder. It’s another miserable week for Warrior. Pirate Warrior’s win rate remains acceptable, with decent matchups against Jade Druid and Razakus Priest, but it struggles against Tempo Rogue and is simply outclassed by it since it is much more vulnerable to being countered. There have been very little developments when it comes to other Warrior archetypes, which show very little signs of life. Taka hit #17 legend with a Taunt Warrior build that drops Fiery War Axe and runs one Golakka Crawler. These cases of individual success can happen, but they aren’t necessarily indicative of hidden potential. Fatigue Warrior builds continue to exhibit some of the worst win rates you can measure. There is no doubt that the Fiery War Axe nerf absolutely killed the class, and the next expansion cannot come soon enough for Warrior fans. Jade Druid has been gradually improving every day since the balance changes hit. Slowly but surely, it has shaken off the loss of Innervate and adapted. Now, it is in the midst of a significant spike in popularity that is felt mostly at higher levels of play, but will eventually trickle down to lower skill levels. We’re waiting to see where and when this climb stops. One thing is certain, the archetype is still very dominant, and there is a possibility that it will eventually overtake the #1 spot, both in popularity and performance. It is already beginning to heavily suppress the performance of Razakus Priest, much like it did before the balance changes, and it’s also catching up in the matchup against Tempo Rogue, with the Rogue’s advantage quickly dwindling. Could Jade Druid rise to terrorize the meta once again? Find out next week! 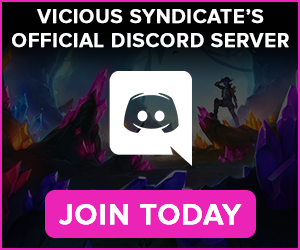 Special thanks to Leo G, Chungfr, Kognar, Aaron B, Jed M, Drew M, Alan J, lalasong, Eric L, Steve F, Batz, Jeffee83, Zolstar, Pink Mage Diaries, and Dekkster Gaming for supporting us for the month of October. 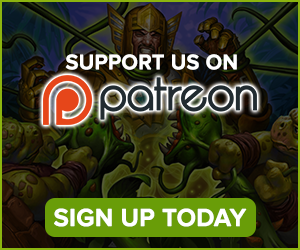 A HUGE thank you to our Tier 5 Patron(s): ByteCookie, and Curt S!